Anyone that knows Santa Fe, New Mexico, knows that the arts here are unlike anything you have ever seen before. Whether it is the area’s traditional crafts or musical events, people flock to the city to experience it. The Santa Fe Chamber Music Festival is a 6-week summer event that has been drawing crowds of festival goers for more than 45 years. You do not want to miss this year’s festival; the lineup is incredible! 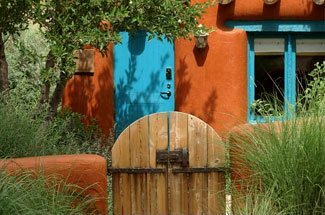 As you begin to plan your getaway to Santa Fe, be sure to download our free Vacation Guide. With our free guide, you’ll receive information on upcoming events like the Santa Fe Chamber Music Festival, fun outdoor recreation, local restaurants, and attractions worth visiting. This list of handpicked, local recommendations has helped countless travelers plan their vacation, so get your copy today! The goal of the Santa Fe Chamber Music Festival is to bring outstanding music to the community through acclaimed chamber concerts. One of the festival’s other main missions is to provide educational opportunities to local students year-round. Just a few of these programs include Music in our Schools, Guitars in our Schools, Strings in our Schools and Youth Concerts. It’s for a good cause, so you can feel great about going and enjoying the music! When is the Santa Fe Chamber Music Festival? The Santa Fe Music Festival usually occurs in the middle of summer for a little more than a month. Check out their complete list of events to see what is going on during your stay at Four Kachinas! We recommending getting tickets to some of the events in advance in case they sell out, but others are free to attend. Tickets for the event can be purchased online. All you have to do is make an account, then purchase tickets for the events you are interested in. For those who have tickets but are no longer able to attend, you can choose to donate their tickets back to the festival by filling out a form on their website. That way, everyone possible can go and experience the music! 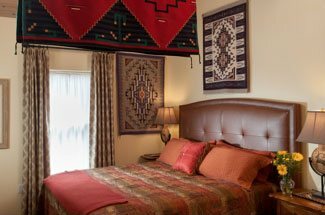 For a cozy place to stay while you’re visiting Santa Fe, stay with us at Four Kachinas Inn. 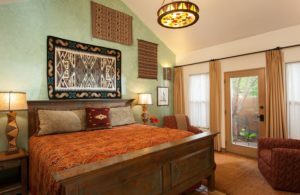 We are home to 6 charming guest suites, each featuring New Mexican and Native American décor. When checking availability, consider our Zia Room with its king size bed and private patio. If you’re celebrating a special occasion on your vacation or want a little something extra, let us help you plan all the details with our Santa Fe Style Special Treatment Package. We can arrange to have fresh flowers, champagne or other celebratory items delivered to your room during your stay. We look forward to hosting you during the Santa Fe Chamber Music Festival this summer!